Apple did something revolutionary and did take the keyboard away from the netbooks, gave it a touch screen a fast mobile OS and called it iPad. 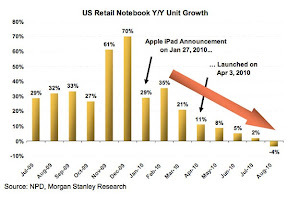 Notebook and especially netbook sales slowed growing down and even declined since the iPad came on sale. The statistic is one year old and the overall PC market slowed down, however Apple did take a big piece from the netbook market. last year Apple sold almost 15 million iPads and is expected to sell this year 44 million. All netbooks from all vendors did sell in 2010 together 33 million. And is expected to sell 30 million this year. I give netbooks not more than two years. As great the iPad as, it is not yet a notebook replacement as I wrote in many blogs, but it will come. For now the iPad is mostly in use to read, surf the internet, to watch movies and to play. But the iPad could be so much more, if we would go beyond touch. The iPad has a camera which could read gestures and has a microphone for voice control. However developers are not yet utilizing these features and Apple is not yet pushing for it. The latest iOS 5 beta 5 version has a little microphone symbol on the virtual keyboard, which could indicate that voice control is coming soon. Knowledge should have Apple enough. They bought in April 2010 Siri which had their little butler app. Siri was specialized in voice search. By tying together various APIs from across the Web, from such services as OpenTable, Twitter, and Rotten Tomatoes, among many others, Siri has concocted a voice search that relies more on natural speech. With so many services to search, Siri also specializes in directing its software to find the right service for the best answer. And then there is the collaboration with Nuance which makes Dragon an awesome speak to text app for the car. You speak your SMS that you don't need to touch your phone during driving. The iPad is not as mobile as the iPhone. I think we can call the iPhone globile (global mobile, we take it everywhere and use it everywhere, even on the Mount Everest). And from now one I will call the iPad lobile. Lobile is a combination out of local and mobile. The fact is, we don't use the iPad everywhere we can to any time. We usually take the iPad to a place and then we use it there within a radius of 60 feet. We start to read on the coach, then we take the iPad to the kitchen to drink a coffee and to keep reading and so on. But a lobile device needs more than touch. I have two hobbies and I am always frustrated that there is no app for what I am looking for. Even if Steve Jobs like to say there is an app for everything. Did you ever cook? I do a lot, and before the iPad was even in the news as the new fancy device, I had build a 15 inch touchscreen with RDP to my computer in the office. The touch screen was mounted in the kitchen as recipe book. My wife and I like to cook and have tons of recipes. I was sick to print recipes out and did build a small recipe app and saved all recipes in there. I sold my little 15 inch device on eBay, as soon the iPad came out and we use since then the iPad as recipe book. The dream of each amateur chef. Stop!!! Not so fast. Yes i use the iPad to look up recipes and guess what I still print them. Any idea why? Guess what happens when you cook? All get wet? Not necessary. But your hands are getting dirty, and you can't touch your screen without making the screen dirty. The second little hobby, i have, is to work on my motorbike and my RC car in the garage. Actually it is even more. I like a lot of projects where I can use my hands to build something. As an example I did build last year a 4foot * 4foot * 8foot wood box for a magic trick. It does not matter what I do in the garage, I like to have my iPad with me. When I am working on my bike I have a technical manual open to see where each part goes etc. When building wood things, like the box, I look at my drawings on my iPad to know how I need to cut the wood. But all the time I have something in both hands or they are pretty dirty. Or imagine you have breakfast and you read the NYTimes. In one hand your coffee and in the other hand a bagel. Did you ever ask yourself why we can't just wave our hand in front of the iPad? Or just could say next or play etc? This is the next step for lobile devices. We need to be able to communicate with our device without touching it. It would be simpler as many think. Voice control could be limited to 8 words and gestures to 4. This is all we need. Start, stop, next, back, play, pause, continue, close. Or wave your hand from left to right from top to bottom from right to left and from bottom to top. I hope the little tiny microphone will not just an icon but an indicator that voice control will be standard in the API and then we will see many cool apps. Google, meanwhile, has voice-enabled every text field within Android, which lets users dictate text into anyplace it is possible to type. Google even has voice search in the official Google Search app for iOS. Further, Android users can perform actions such as "Call Bob's Cell" and have their phone automatically perform that action. iPhone has as well some voice control to call your contacts and it works more or less ok and is yet not so sophisticated like the Android voice control. But again even Android does not go far enough. I would prefer touch to fill out a form because of my accent, but for recipes app, manual and news, why not using voice or gesture? Steve Jobs is stepping down, good or bad? Thunderbolt and SSD or not?